Despite the fact that this majestic mountain is now located outside the territory of Armenia, we cannot help giving it special attention in this article, because it has always been and remains a revered symbol of the motherland for all Armenians. 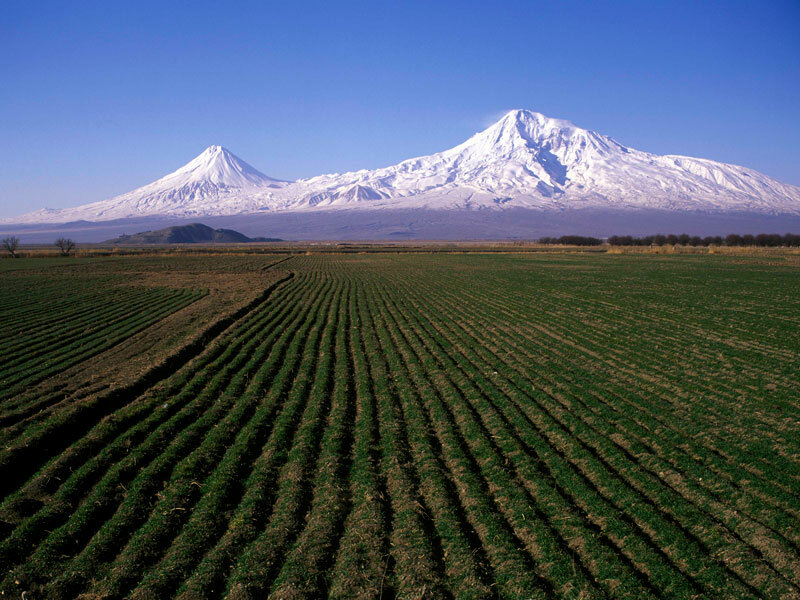 Mount Ararat is the highest volcanic massif of the Armenian Plateau and is composed of two cone-shaped mountains – Big (Masis) and Small Ararat (Sis). It is not an accident that Armenians have always had a revered attitude to this amazing mountain. The fact is that according to the Bible it is exactly here that the Noah’s Ark landed after the Big Flood. Together with his family he came down from the mountain to Ararat Valley, began to live there, and planted vineyards, which was the beginning of winemaking. That’s why Armenians respect Ararat and climbing it is considered a pilgrimage to the holy places. There is some evidence proving that the arch indeed landed on the mountain. For example, in 1974 Americans made photos of Ararat from the height of 4600 m, after zooming in they saw a big object resembling an ancient ship. By the way, even on the coat of arms of Armenia in the very center you can see an image of Ararat with an arch on the top. For many years, Ararat has served an inspiration for Armenian poets, artists, and writers. It is not surprising as it is difficult to describe by words those feelings and emotions that arise when you watch this Biblical Mount. 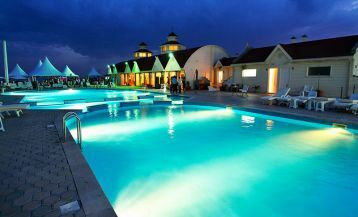 If you want to enjoy the most beautiful view of it then without any hesitation come to Armenia, as only here opens the most scenic view. Climb the stairs of huge Cascade in Yerevan or travel to Khor Virap Monastery known for its amazing view to Ararat. It is absolutely breathtaking! 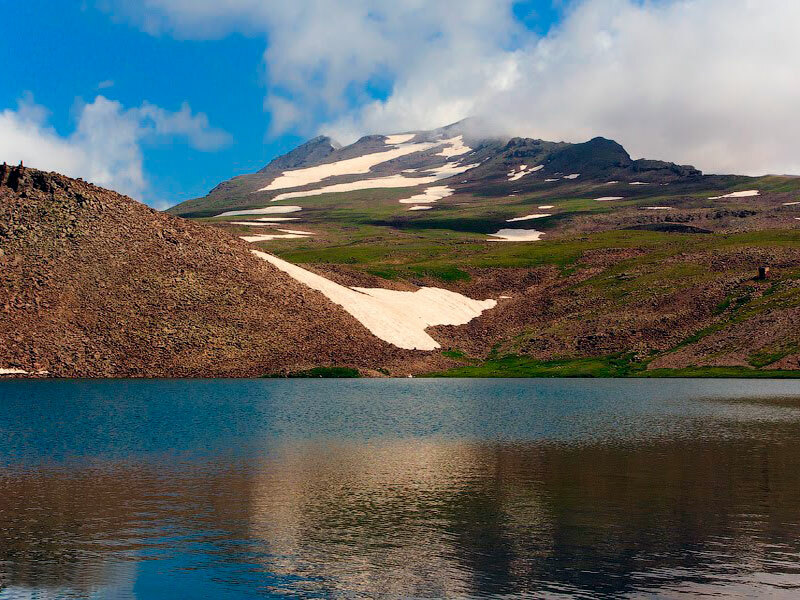 Mount Aragats is the highest point of modern Armenia (4090 m) and is located in Aragatsotn region, which is sometimes called the “Garden of Armenia”. 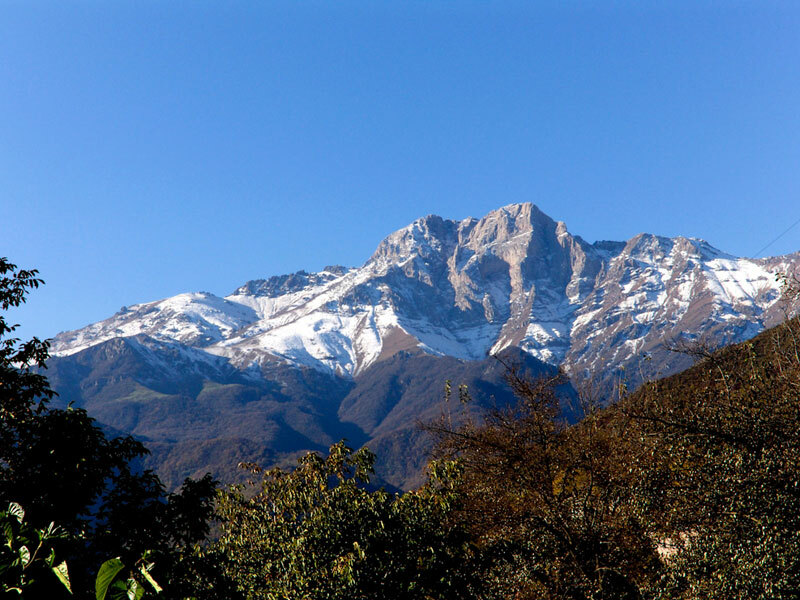 It got this name because of the amazing beauty of its nature: the vast mountainous territories here are surrounded by alpine meadows which are covered with fragrant flowers. 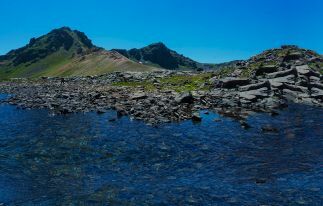 So in this wonderful place is situated Aragats – the favorite place of climbers and trekking lovers. It is also important to pay some attention to its name, which has an interesting story. 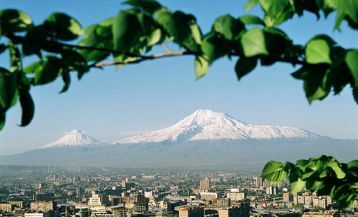 The mount was named after the famous Armenian king Ara Geghetsik (Beautiful) and is translated as «the throne of Ara». From the distance, the top of the mountain resembles the image of that great king. As it was mentioned above, the climbing to Aragats is very popular not only among locals but among foreign active holiday lovers as well. Most often they practice climbing the southern peak, which is not very high, and the itinerary is often started from the beautiful Lake Kari so picturesque against the backdrop of the beautiful mountain landscape and alpine meadows. 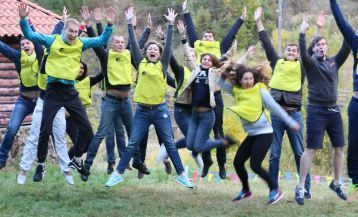 You can choose our tour “Trekking to Aragats” or Hiking Tour to Armenia and to make an ascent accompanied by professional guides. Mount Azhdaak is the part of Geghama Range and the third highest mountain in Armenia. It also attracts lovers of trekking from different cities and countries. 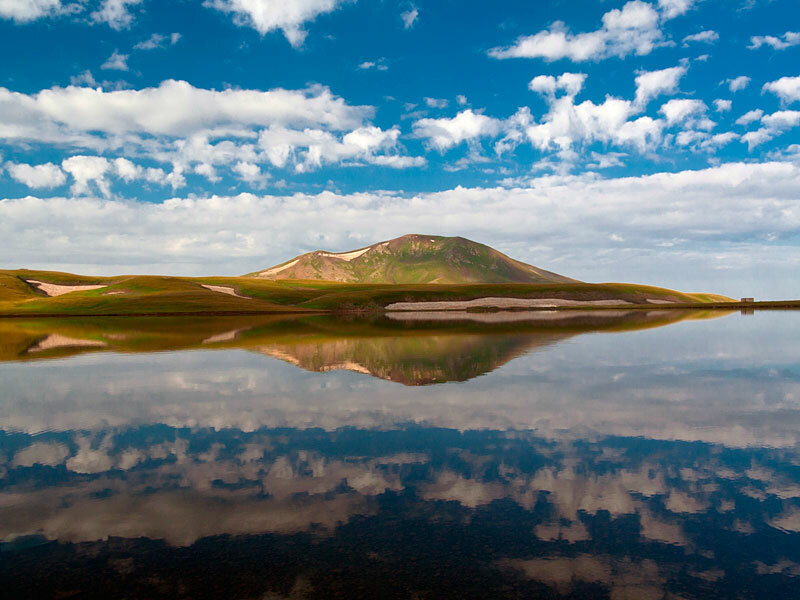 The highlight of Azhdahak is a small lake of incredible beauty, located in the crater, it is filled with ice water all year round, and its water is so clean and transparent that you can see the very bottom, the depth of which reaches 90 meters. 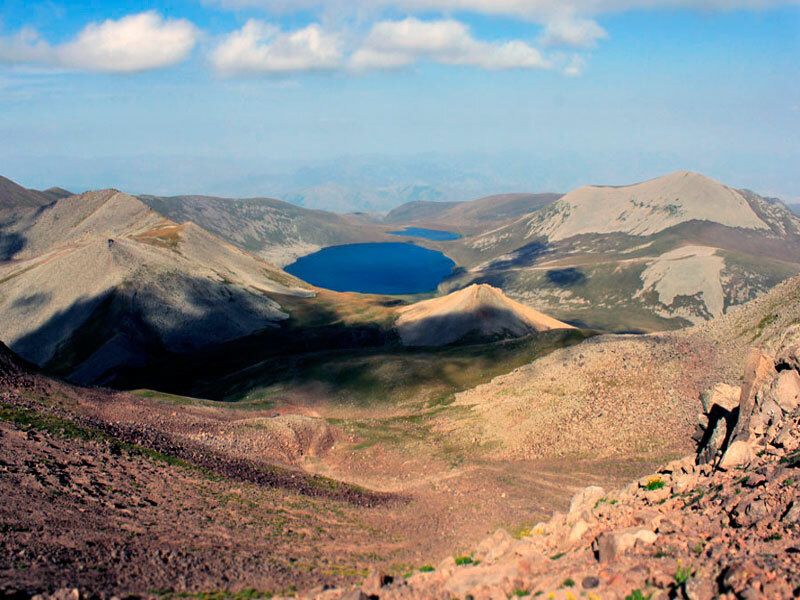 If you climb the top of Azhdahak which will take about 6-8 hours, you’ll get a breathtaking view of the famous lake Sevan and Atis, Aragats and Ara Mounts. For those who wish to conquer this mountain we offer a tour “Trekking to Azhdahak”. In Syunik region, there is a picturesque mountain range called Ishkhanasar. The mountain has several peaks, the highest point of which is the Grand Ishkhanasar (3550 m), and to the north stands Small Ishkhanasar. From Armenian its name can be translated as “prince’s Mountain”, and indeed it looks very noble, reminding either an eagle with outspread wings or a crown. The climbing to it is also widely practiced by trekking and hiking lovers. If you climb the height of 2700m you will see an amazing Lake Sev (Black Lake), the water of which is so warm and transparent on hot summer days that you can even swim. The top of Ishxanasar offers an indescribably beautiful view of the surrounding fields, mountains, and lakes. Syunik region is also famous for the other majestic mountain called Khustup. 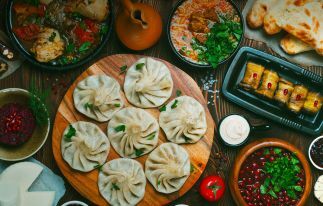 Besides its beauty, Khustup is also known for the fact that in its environs fought great Armenian commander Garegin Nzhdeh, who was buried on the slopes of the mountain. The commander was not only a prominent military man, but a good politician and statesman. He left a huge mark in the history of the country and it is thanks to his military activities that Syunik-Zangezur are now a part of the Republic of Armenia. 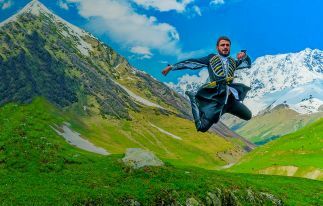 A pilgrimage to Mount Khustup became a real ritual performed by those who keep in the heart the memory of his heroism.